“The Joy of VFX” is thought as a happy place where several VFX artists come together and try to mimic awesome effects seen for example in movies. The goal is look at the different approaches and learn of their pros and cons. The idea comes from Zoltan and Attila and these nice guys proposed to put it on my blog since it’s similar to what I do. We hope you like it. 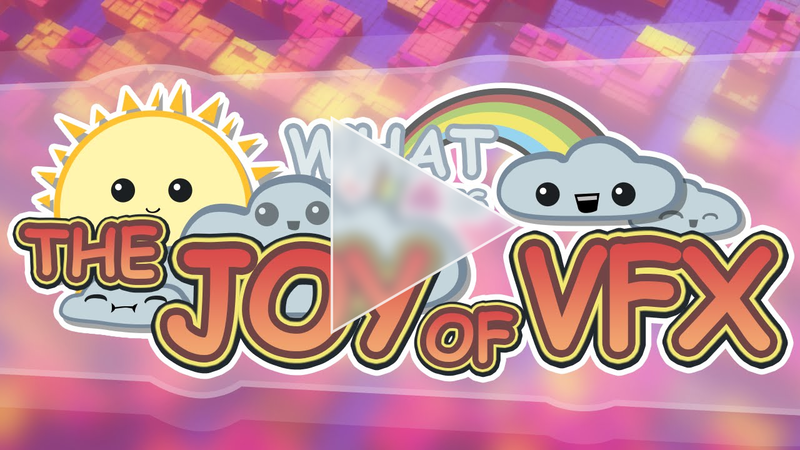 Further “Joys” might be published on a separate blog. Since we all used the same basic principle, here’s a short description about the basic concept and later every single approach is explained in detail. 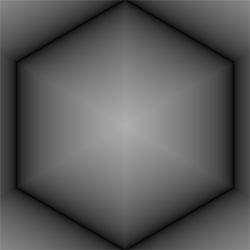 For the example above you can see the vertex color visualized directly on the cube for better understanding. To have more control about the movement we can use a height-map instead of a sine wave. Vertex color and height-map are visualized as diffuse color so that you can see the relationship between brightness and upward-movement. My approach is pretty much the same like what was explained above but I used a different geometry. Instead of a cube I used a pyramid where only the central vertex is moved up and down. This is how my happy spikes look like. I tried to mimic the Liberty Island (like seen in the X-Men Movie). But how does it work?! What kind of magic creates a fresh pixel-normal out of nothing? The secret is: comparison. You take the position of the pixel you want the normal for and look at its neighbor-pixel how different their position is in the 3D space. Luckily the graphic card always handles 4 pixels (2×2) at the same time so comparing neighbors is very effective. Below is a visualization how this works when you create a normal-map out of a height-map (instead of the world-position like in my Unreal-Shader). You use the difference between the neighbor-pixels to create two vectors. Now you can can calculate a new vector which stands 90° on the two others: voilà! We’ve just calculated the pixel-normal! My solution creates many thin triangles which is kind of a worst-case. You get many ugly edges (if there’s no anti-aliasing) and GPUs don’t like thing triangles which I described here in my Render Hell Article. Zoltan’s current Unreal Engine 4 project is a game set in a retro futuristic 80’s house where he puts the pin table in the garden. It is meant to display different things from a fake pond through a chess board to a hedge maze mini-game. Now let’s talk about how it was made. In comparison to the basic approach (explained above) Zoltan wanted to use 6-sided columns as pins instead of cubes. Problem: All hexagons are one mesh and connected to each other so they can’t move up and down individually yet. While Simon’s cubes where separated from the beginning Zoltan uses a slightly different way to solve this: With tessellation. He tessellates the hexagons to create a gap between the cells. The big advantage is that all the new polygons are created on the fly on the graphic card which reduces storage on the disk and transport-cost from disk to graphic card when my model is loaded. Important: Note that the tessellation-algorithm is kind of special. 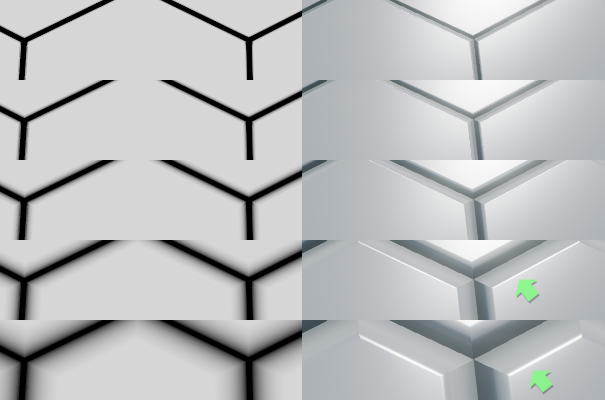 It’s more comparable with beveling/chamfering the edges (left) instead of just dividing the polygons in its half (right). The original outlines of each cell should not be displaced at all, only the newly created inset supposed to rise. We’ll do this with a mask which is explained below. But since they’re pushed a lot the walls are close enough to vertical so this trick is not apparent. Now we’ve to tell the engine that only the inset areas are allowed to be moved. Instead of applying vertex color like in the basic approach he creates and uses a gray scale mask for that. This mask will be created by the shader – not by hand! Finally we can push the columns upward properly! But for doing that something or someone has to tell them how much to raise. The basic approach used hand-made textures but here it gets a bit more advanced. Zoltan captures this scene from above (like a camera but in Unreal this is called “scene capture 2D”) and store the results into two textures (scene capture target), one for color and one for height. The pin table will use this data later. Small hack: Unreal lacks orthogonal render-to-texture cameras so he had to put the scene capture actors roughly 100m from the target surfaces and set the field of view to 1 degree to decrease the perspective distortion. Instead of accessing the depth buffer of the captured scene and use this as displacement data for the pin table, he uses the world position of the pixels as height information. In addition the geometries can have gray scale textures applied which are also interpreted which is a huge plus in comparison with a standard depth buffer which doesn’t care about textures at all. This was done in similar fashion like we created the hexagonal gray scale mask. Triangle after triangle was taken and hardwired world normals assigned to each of them. Here you can see how he assigns the values. For those who wonder about the colors: vector coordinates like for example [1,0,0] (XYZ, vector points to the right) can be interpreted as RGB values. If you translate the max. vector value (1) to a max. color value (255) you’ll end up with colors like shown in the picture. For example [255,0,0] (vector pointing right) or [0,255,0] (vector pointing down). Note: If you want a vector pointing to the left or up you have to use negative values like [-1,0,0] and since we can’t represent negative colors you’ll end up with black. The top is colored in blue because a vector of [0,0,1] correlates with [0,0,255]. That’s it! We hope you liked this approach as well. But last but not least: Let’s talk about what didn’t go perfectly well. This solution has the downside that pre-calculated normals won’t adapt to actor rotation so if the mesh doesn’t have default orientation then the lighting is broken. 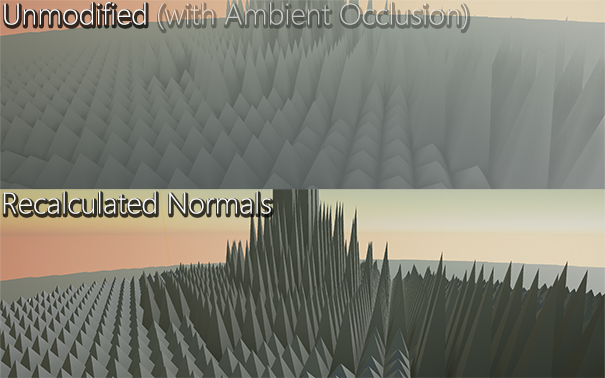 Temporal anti-aliasing helps but the mesh still looks very noisy. To work around that Zoltan set the diffuse color of the material to 0.02 and added the color as emissive. This decreased the effect of the lighting and limited the possible differences in brightness between the sides of each column. So while the moire effect is still there the temporal anti-aliasing has a much better chance of eliminating the artifacts because the pixels don’t vary that wildly anymore. He chose this workaround because it also worked both artistically and from a narrative perspective. He made it look like there are colored LEDs in each tube and the light scatters in the translucent plastic. That added detail and some idea how the thing was constructed in the game’s world. And now let’s look at Attila’s way of the pin table! Like Zoltan, Attila uses a camera to capture a hidden 3D Scene and uses the captured data as input for his pin table. And since Unity has a camera system which offers orthogonal cameras (unlike Unreal) he didn’t have to use a “hacky” solution like Zoltan described above. The pin board rig can be thought of as a volume in space that the user can setup and move around. A pair of ortho cameras render the height and color maps of what’s happening inside, according to objects within the volume. 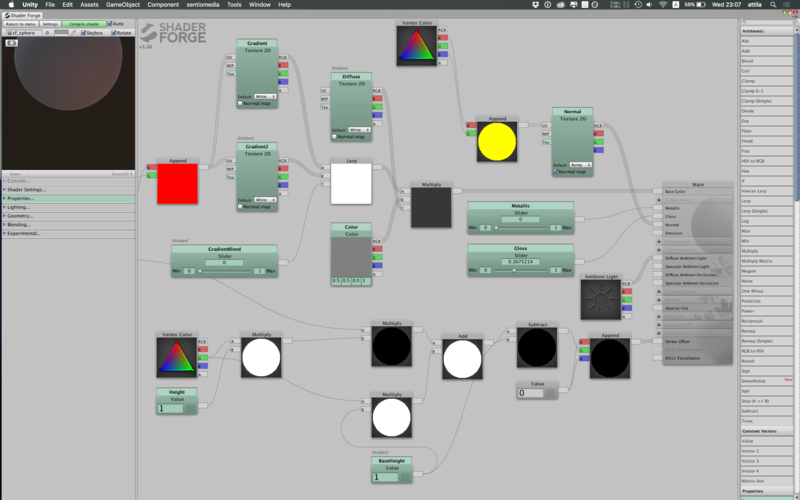 This information is used by the pin table shader to displace/colorize a custom mesh. 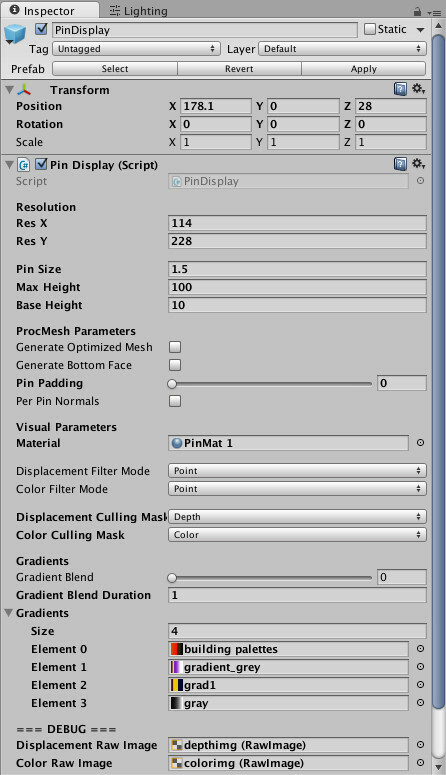 The resolution of that mesh can be specified as well as height-dependent gradients to further color the pins. The “vfx” letters show off the separation between the height/color info. The gray letters can only be seen by the height camera so they contribute to displacement only (brightness = height), the yellow ones are for the color camera. He dragged the 2 objects apart for clarity, but usually they would overlap. It’s the same for the red bunny, where the red color version and the one with a depth shader on it overlap and look weird in the editor. 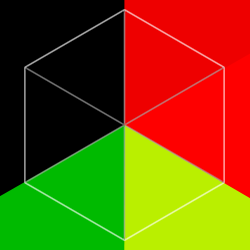 The green cube is on a separate object layer, not seen by either of the height or color cameras. To generate the necessary data he used one camera per map. Each camera is set to be in ortho mode and the view is set to cover the whole pin board volume. Attila fell in love with the flexibility of Unity’s camera system. Each camera can be limited to only render objects in specific layers, so objects that meant to only show up in the board can happily coexist with the rest of the scene. It’s also possible to use any post process effects or other tricks on the cameras (see section “Peakblur Shader”). Really interesting: I used a hand-made mesh, Zoltan modified his hand-made mesh via shader (tessellation) and Attila goes the way of creating the whole mesh by code! At its core each pin is basically a unit size cube, optionally without the bottom face. He stores position data in vertex colors (used as a multiplier for the displacement like explained in the basic approach), and UVs (so each vertex in the board knows where to sample the height/color maps). Besides of the procedural mesh generation the C# code takes care of frame by frame updates and has some editor-specific features, like drawing a 3D gizmo representing the volume of the board for easier editing. A scene can contain multiple pin boards, and each can have its own camera setups. He started out creating the shader by hand, but (after Zoltan’s nagging) Attila ended up using ShaderForge for it in Unity, and it worked out fine. Beside the height/color maps the shader also has inputs for gradient textures, blending between them is managed in the C# code. Attila’s showcase video consists of 3 parts. For each part he created a separate color gradient to set the mood. He flicked between parts using keyboard shortcuts. That’s all! We really hope you liked the different approaches with all there differences. In any case, please tell us what you think about this small project and if you would like to see more of it. This entry was posted in Game Art Tricks on 10. July 2016 by Simon. I’ve been following your blog for a while and you’re doing a great job! I’m currently a student learning OpenGL and Computer Graphics in general, and the content you post helps me stay motivated whenever I feel a bit overwhelmed. Oh and I don’t think people would mind if you were to have this series appear on this blog, instead of keeping it as a side project. As always, awesome article and awesome new concept ! Hey Simon! Damn I love this effect!! :D Nice that you are covering this!! In Frameranger by Fairlight & Co.
Or in 1995 by kewlers: but this time in 3D! Íñigo Quílez ak iq, also a demoscene guy: Has is a shader “Cubescape” on his webtoy: here as a kind of sound equalizer view. (actually I did something similar but veeeeeery basic for a small strategy game: Future Wars. moar: 3D-Städte aus lokalisierten Einkommens-Daten static tho. But neat premise with the underlying data. I really like seeing the different to the same problem. I like this new “experimental” format as a nice change of pace. His kinect project seems interesting in that regard too! Sorry I forgot to mention that the shadertoy links might be quite heavy! Be careful before pressing them: save any work. These might crash your browser if it’s doing lots of work already and there are many tabs open. Great stuff. I’ve learned a lot. Thank you Simon, Zoltan and Attila. I’d love to integrate a similiar effect for the temples in my game i’m working on. Thx to you guys for explaining this so well.. i really understood the whole theory behind it! 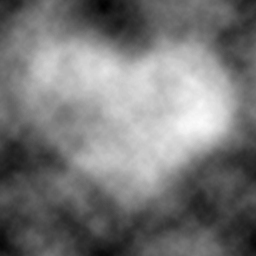 But i still can’t write shaders at all… is there a possibility that you guys show us some code snippets on how you created the basic kawaii cube that is animated via noise map? I’d love to experiment on something similiar in Unity! It looks like 4.13 in Unreal Engine now has Orthographic scenecapture2D’s! I noticed that no one tried to remove the unnecessary geometry within the structure. did you consider not worth for real time updates or is it just out of the scope of these “small” experiment ? Also it’s the first time I hear about accumulation buffer, and the few informations in can find talk about low level openGL implémentation. Can you explain how accumulation buffer was done in Unity ? to be honest, i don’t know what an accumulation buffer is :,( i would imagine that you add color values to them and reduce them automatically over time. What do you mean with unnecessary structure? you mean the “walls” of the pins? I mean, between two neighbour, one side can’t be seen while the other side can’t be seen bellow it’s neighbour top, if they have the same height, both side can’t be seen. For a rectangular shape, removing the unnecessary side can remove as much as 80% of the geometry (for a flat map) and at least 40%. that’s not a small improvement. That would definitally very cool to do. Not sure how it could be made but yeah, there’s a lot of stuff not necessary. I’ve just discovered your blog 2 days ago and I’m already a big fan. I really like the intuitive approach you use to understand and reproduce effects you see in games. I’m not done looking at your blog entries :) … keep up the good work! Nice looking geometry shader! 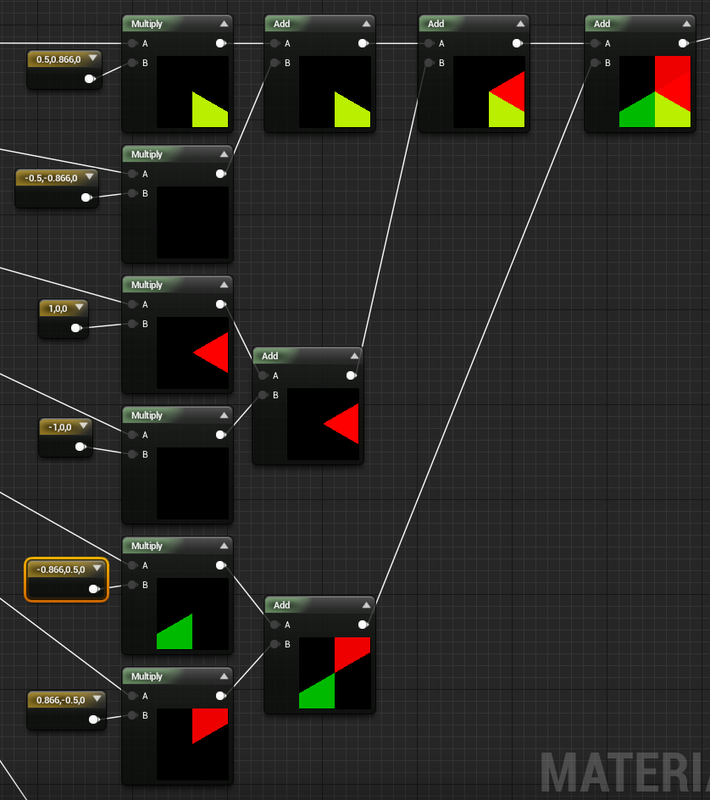 So you did it by code or does Unity have something like visual node networks like Unreal? 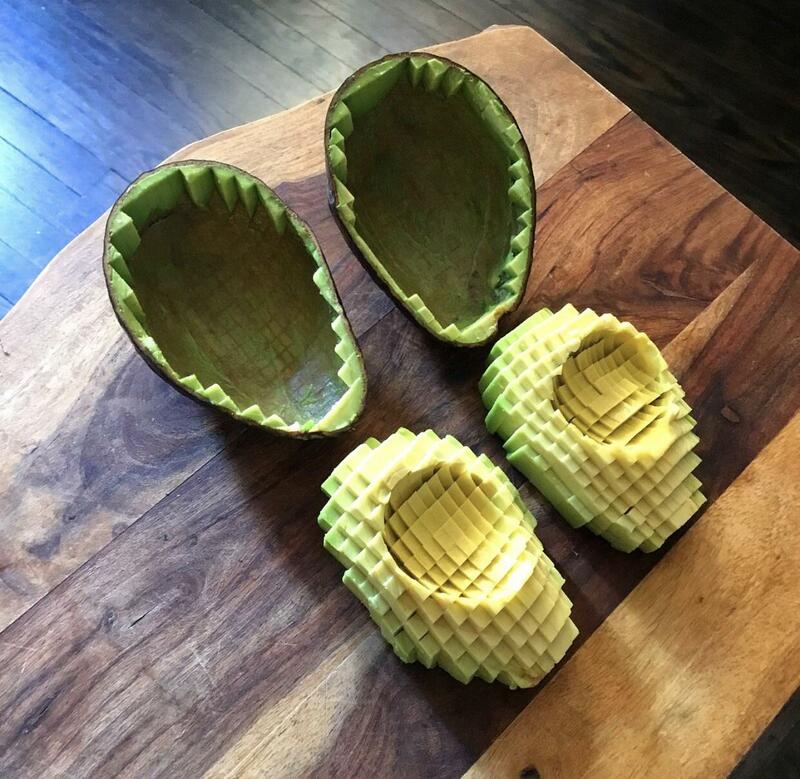 Are those seperated cubes or one single mesh in atillas version? And if it is one single mesh, how can you offset one single cube without the direct neighbors but with one UV map? As far as I remember it’s one mesh containing all the cubes. Every cube has UVs at different positions so that you can control them separately. He generates the mesh but had to split the final mesh into some chunks because of the limitation of Unity when it comes to vertex count. I think per mesh you only can have 65536 vertices.